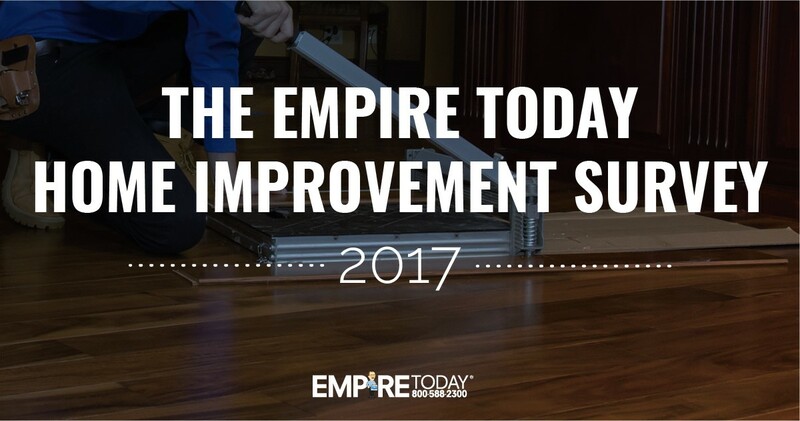 At Empire Today, we wanted to explore trends among recently completed home improvement projects across the United States. We conducted a national survey that looked at reasons for the project, the types of renovations, and some of the costs and payment methods associated with them. 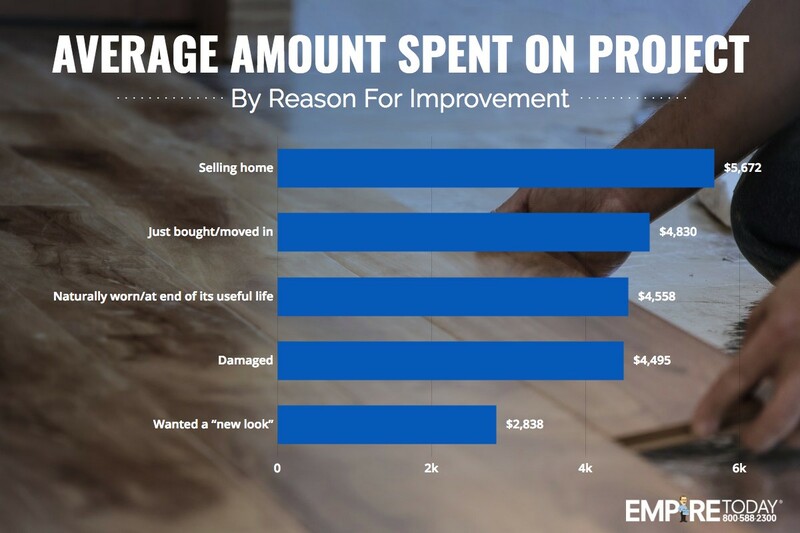 In our survey, we asked 450 American homeowners about home improvement projects that they had completed within the last 36 months, as well as projects they have planned for the future. We also asked about the type and location of each project, as well as the budget and time spent. The main reason for a home renovation was different depending on what region was asked. In most regions, people renovated because they wanted a new look. Interestingly, the second most common reason for those in the South was ‘damaged,’ which was only the third or fourth most common reason in all other regions. 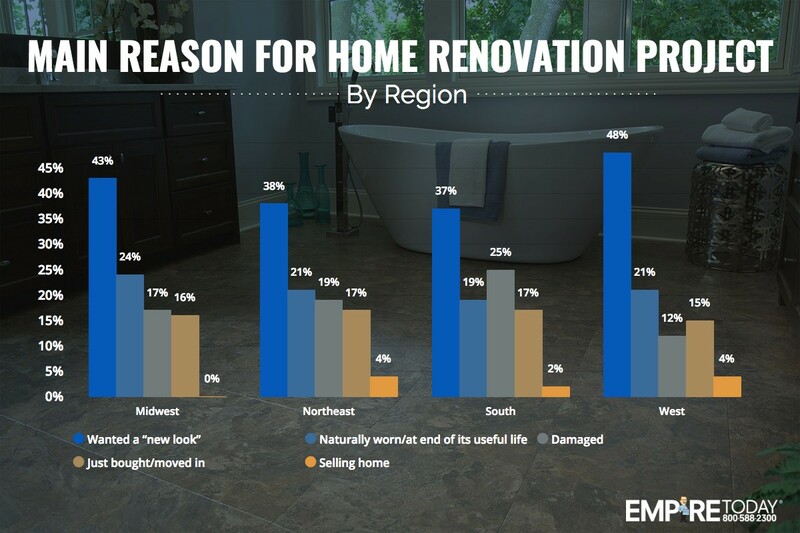 When looking at the specific rooms included in renovation projects, most people said they worked on their kitchen, bathroom, or bedroom. When grouped by region of the country, each one still included the kitchen in their project at a high rate. It was especially common in the West, however, where just under 60% of projects included the kitchen. Alternatively, those in the Midwest, Northeast, and South were 1.24 - 1.3 times more likely than those in the West to include a bedroom in their project. 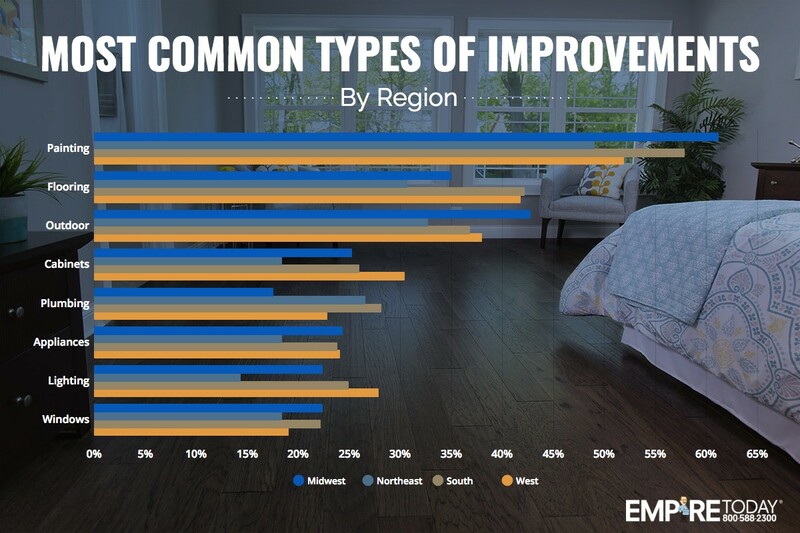 What Home Renovations are the Most Common? We also asked specifically about the types of improvements that were included in a project. Painting, flooring, and outdoor renovations were the three most common types. 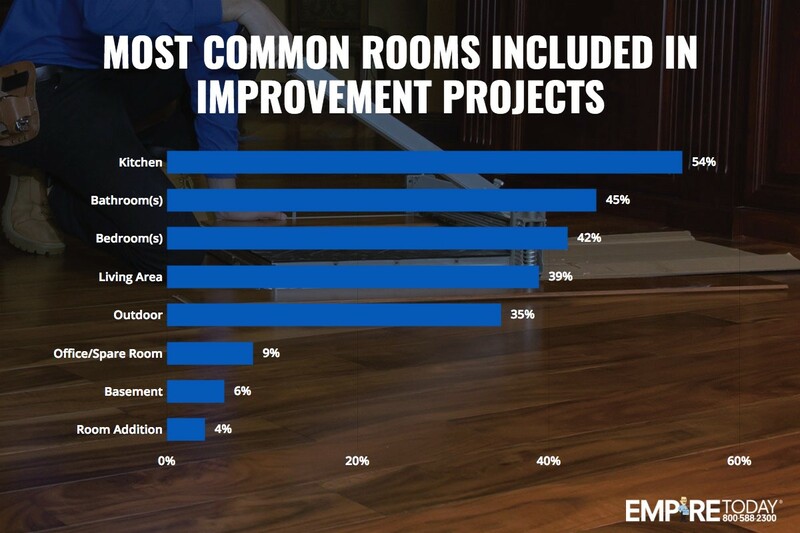 Over half of all projects included painting, with flooring being the second most common home renovation type. Looking at different regions, painting was still the most common type of project. However, there were some differences when it came to the second most common type. 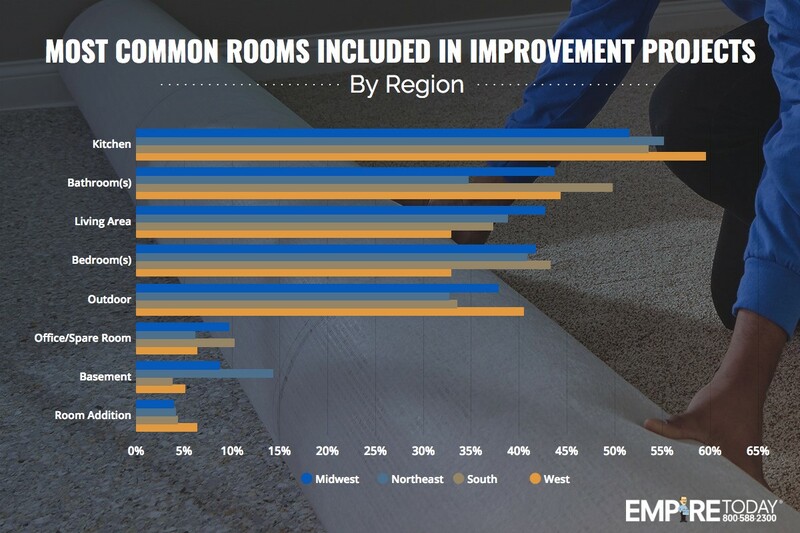 In the West and South, flooring was number two, whereas outdoor was the second most common in the Midwest and Northeast. 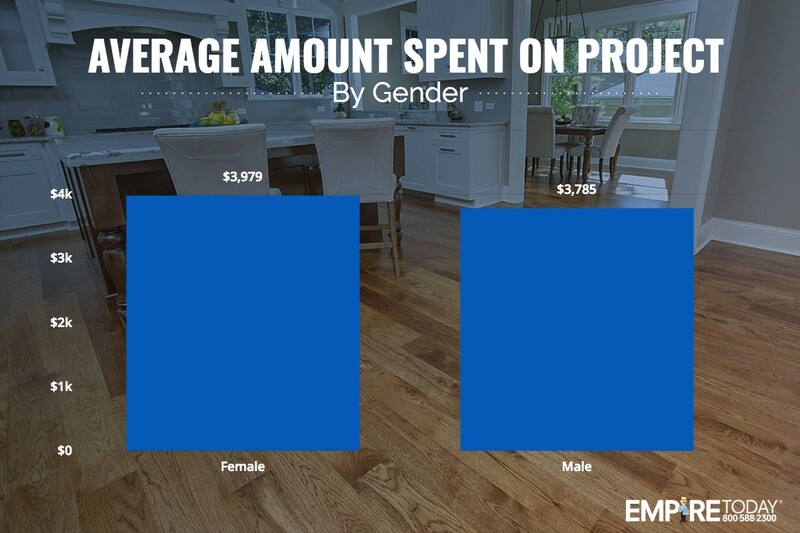 Analyzing the data by gender, women were more likely than men to include painting, outdoor, or appliances in their project. 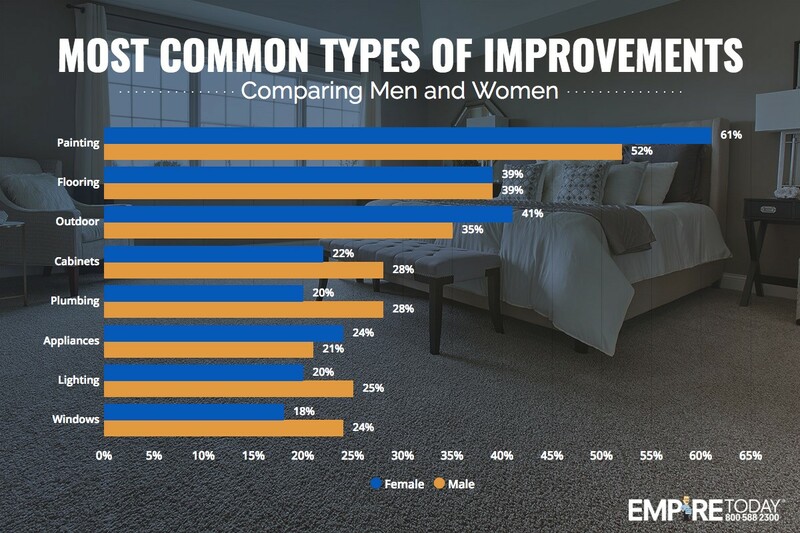 Men, however, were more likely to include cabinets, windows, lighting, or plumbing. It seems that women tend to focus on the more aesthetic features of the home, whereas men focus on the more functional aspects. One of the other main focuses of this study was around cost of projects and the method used to pay for them. Overall, the average cost of any project was in the thousands. People aged 25 - 34 had the highest average of any age group at just over $4,500. The lowest average was for the 35 - 44 age group at $2,900. 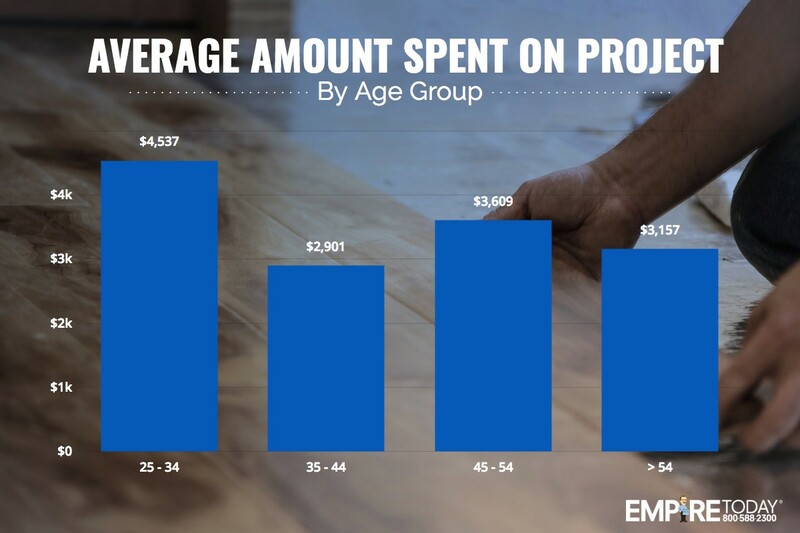 On average, women said they spent about 5% more on their project than men. One of the questions we asked was whether or not the respondent stayed within their original budget for the project. 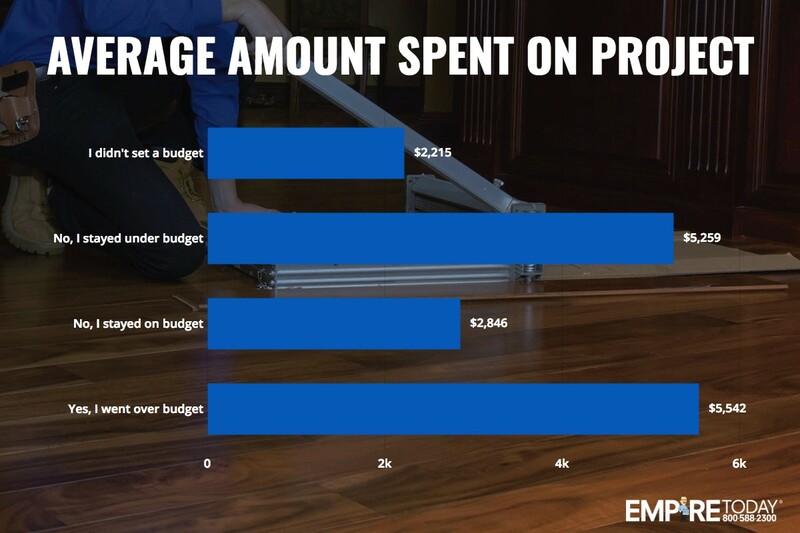 We then crunched the numbers and found the average cost of the project based on how they responded. Interestingly, those who stayed under budget tended to spend, on average, about the same on their project as those who went over budget. 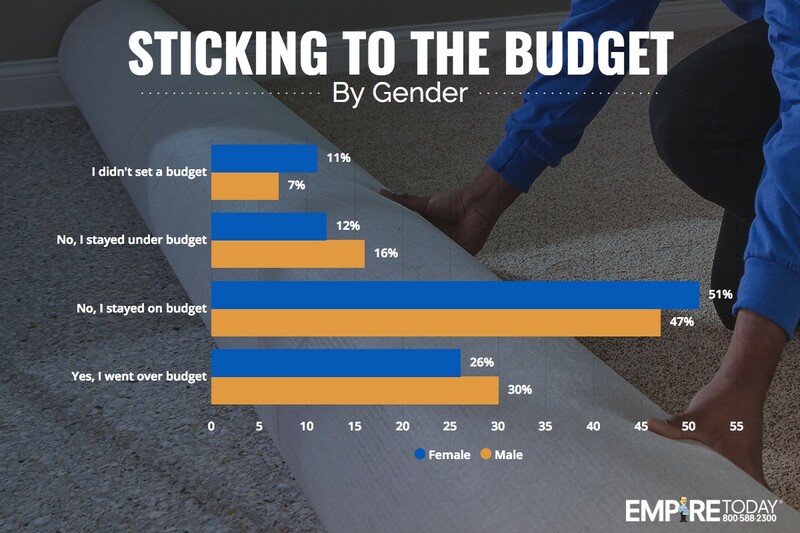 Both men and women reported that they stayed on budget most of the time, but men were a little more likely than women to go over. We also analyzed the average amount spent by the main reason for the improvement project. Those whose main reason was to sell their home had the highest average amount at over $5,600. Those who wanted a new look had the lowest average at around $2,800. 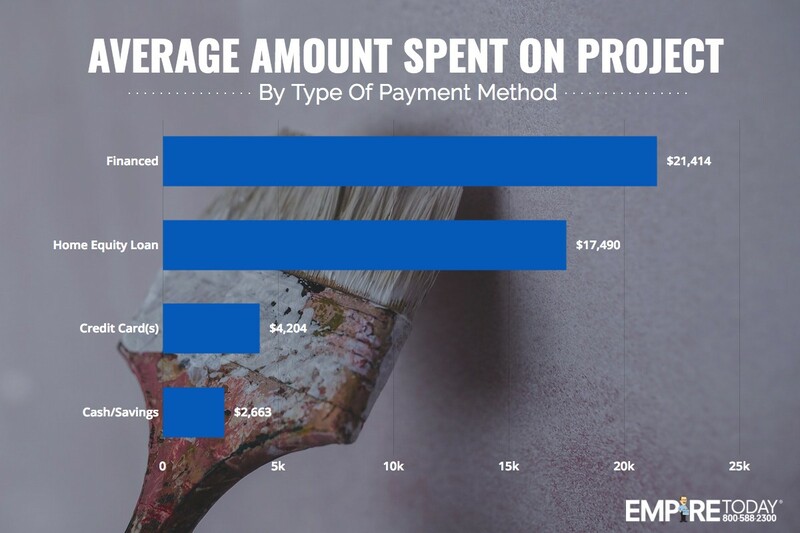 When looking at how homeowners paid for their projects, it wasn’t surprising to find that those who reported that they financed or used a home equity loan spent a considerable amount more than those who used cash/savings or credit cards. Analyzing those payment methods by the original budget, every group except for those who used a home equity loan tended to stay on budget. Those who used the loan, however, tended to go over budget. 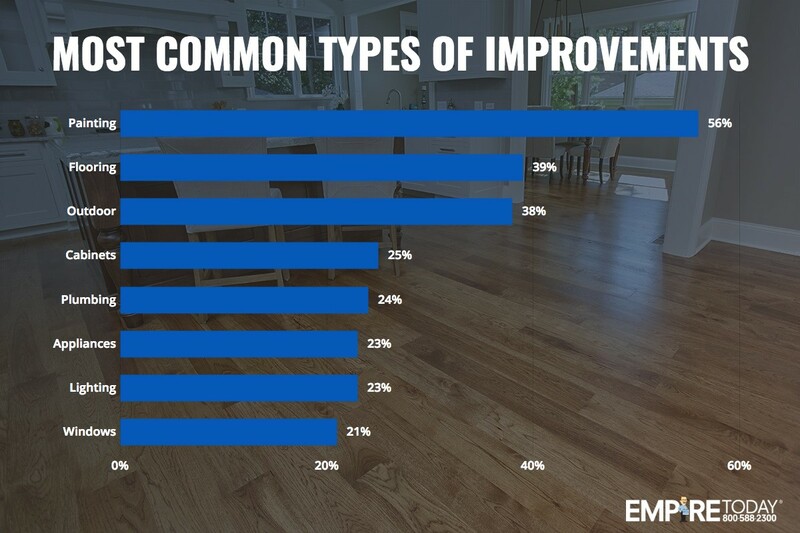 More and more Americans are doing home improvement projects, looking to upgrade, work on, or repair their home for a variety of reasons. This nationwide survey uncovered some interesting trends and statistics on the projects that Americans have recently completed and the projects they want to do in the future.